AirPort base stations released after 2009 are capable of operating over both 2.4GHz and 5GHz bands simultaneously. 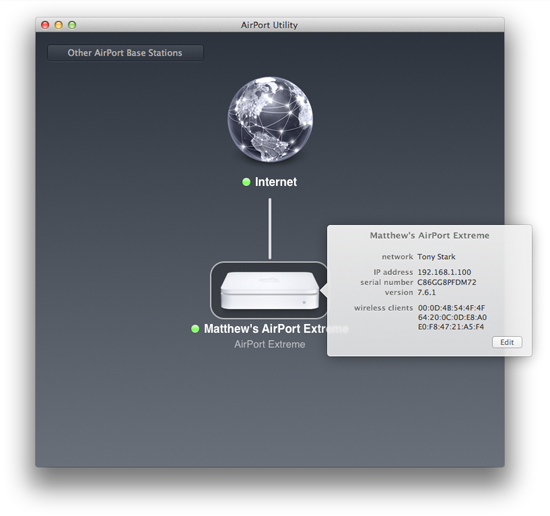 That means that when you connect a Mac, iPhone, or iPad to an AirPort's wireless network, it will automatically select and use one of the bands for the best speed, consistency, and range. The 2.4GHz band is heavily "polluted." Other devices operating on the the 2.4GHz band - like your microwave, for instance - can interfere with your 2.4GHz wireless network. The 5GHz band is not heavily utilized, so you won't experience interference problems while using that band, which means you'll have faster wireless connections. The downside to using the 5GHz band is range. It doesn't travel through walls very well, so if you're on the other side of the home or office, you'll probably want to use the 2.4GHz band. Generally speaking, you should use the 5GHz band under nearly all circumstances. You can reserve the 2.4GHz band for those times when you're working in area located far away from the AirPort, and for older devices that don't support 5GHz. This tutorial explains how to create separate networks for each band. Select the Wireless tab. The window shown below appears. 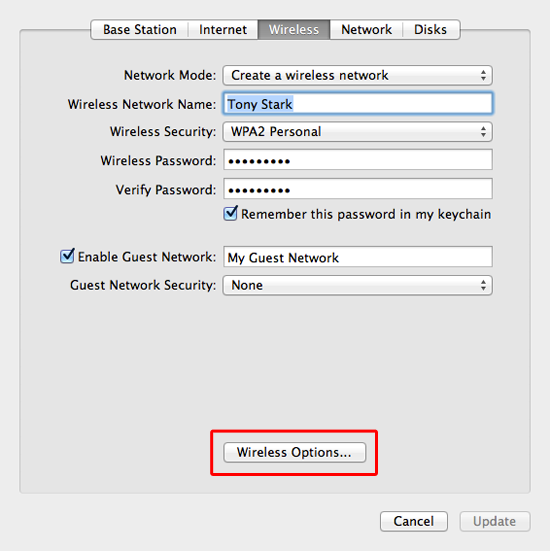 Click Wireless Options. The window shown below appears. 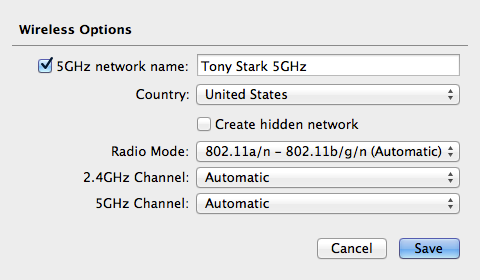 Enter a name for the new 5GHz network in the 5GHz network name field. Make sure you use a name that easily distinguishes it from the primary network. Select your country from the Country menu. Once the AirPort restarts, you'll see the new 5GHz wireless network. 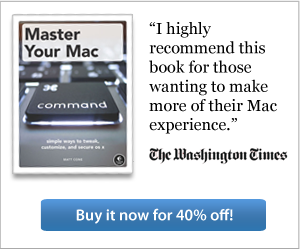 All of the password and encryption options are the same. Remember, we recommend that you connect to this network all of the time, unless you're working far away from the base station or you're using an older device that doesn't support the 5GHz band.